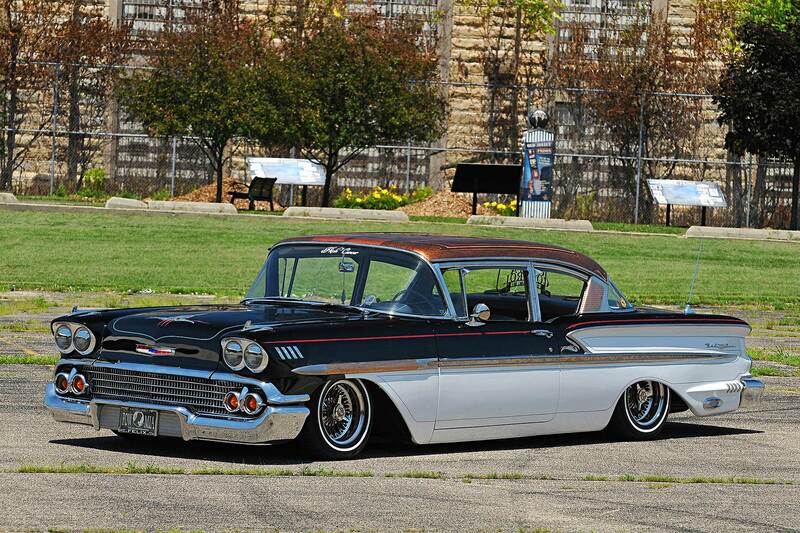 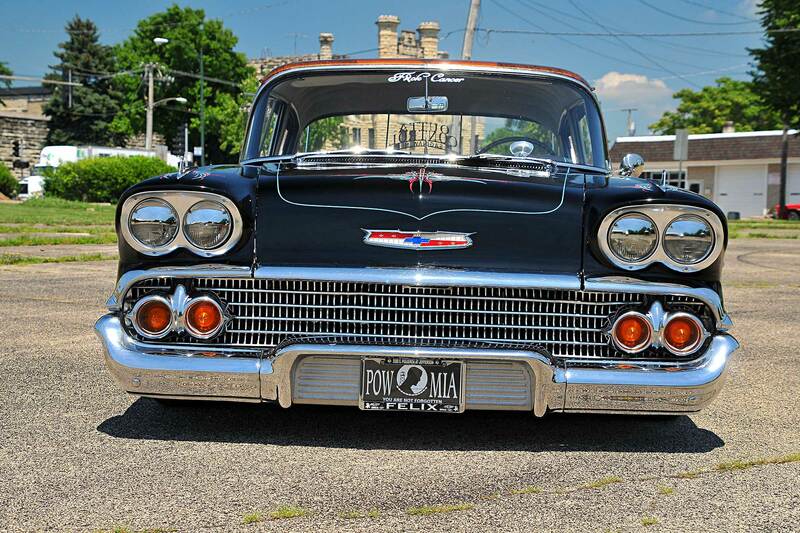 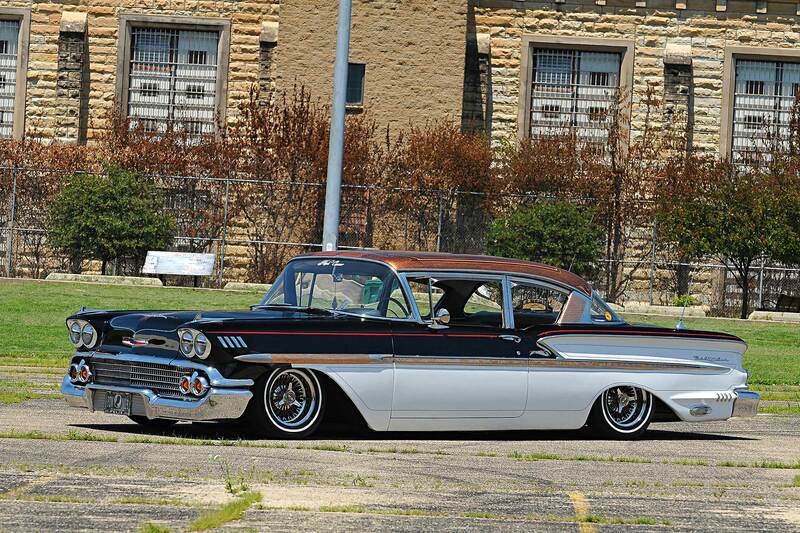 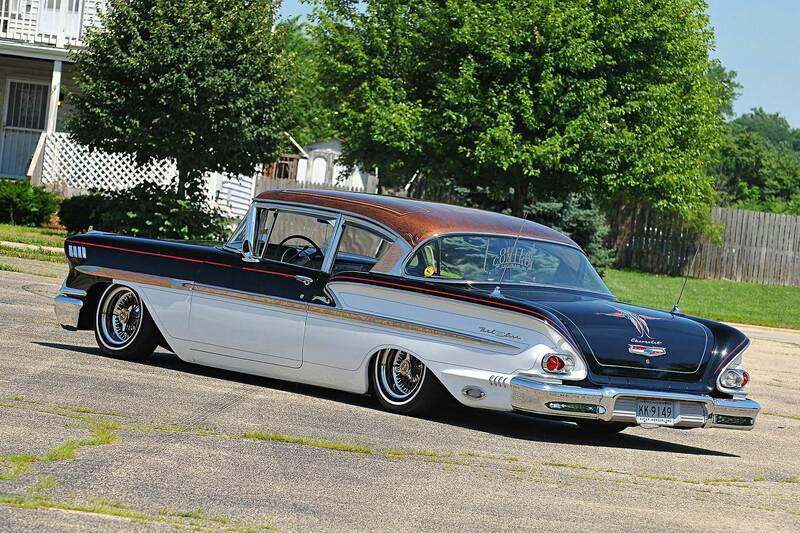 For the past 40 years, the success of the 1957 Chevrolet seems to have overshadowed the glory of the 1958. 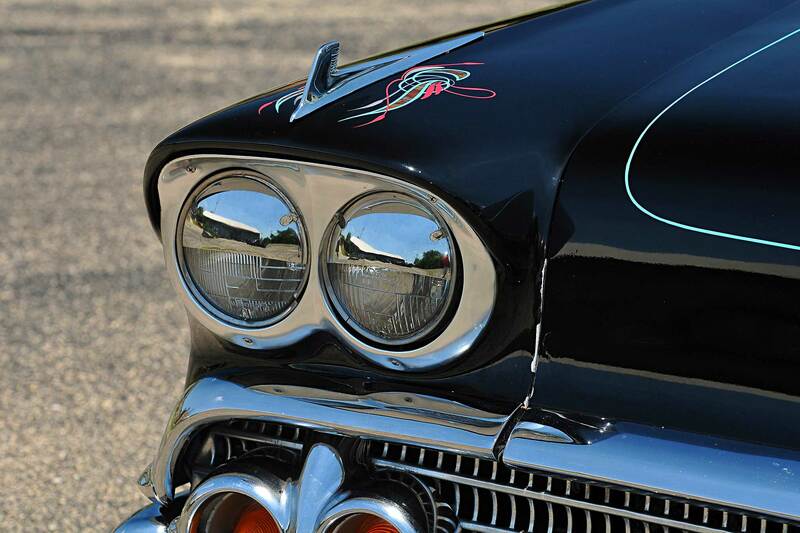 But if you take a historical look back at the sales figures it quickly changes your perspective. 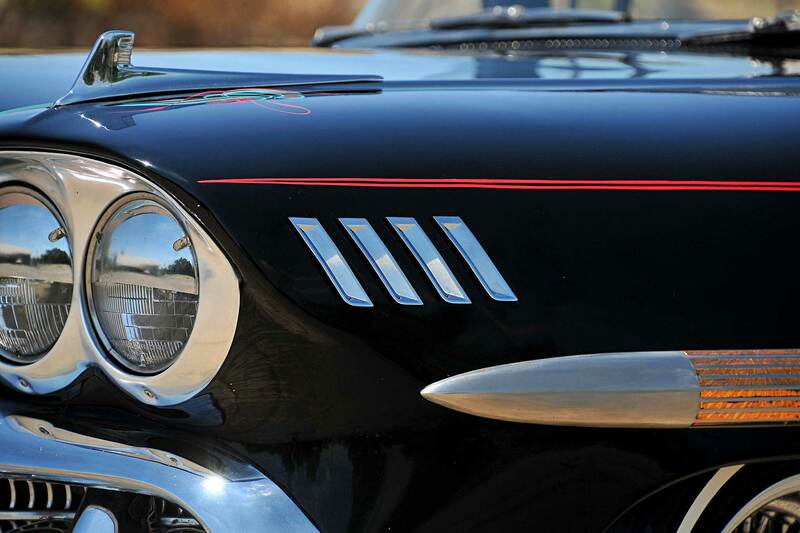 Back in the day, Chevrolet and Ford were neck-and-neck for the number one position in 1957, but if you look at the sales figures in 1958, well, the numbers don’t lie, and it clearly indicates that Chevrolet sold 1,255,935 units, which was ultimately 217,375 more than Ford. 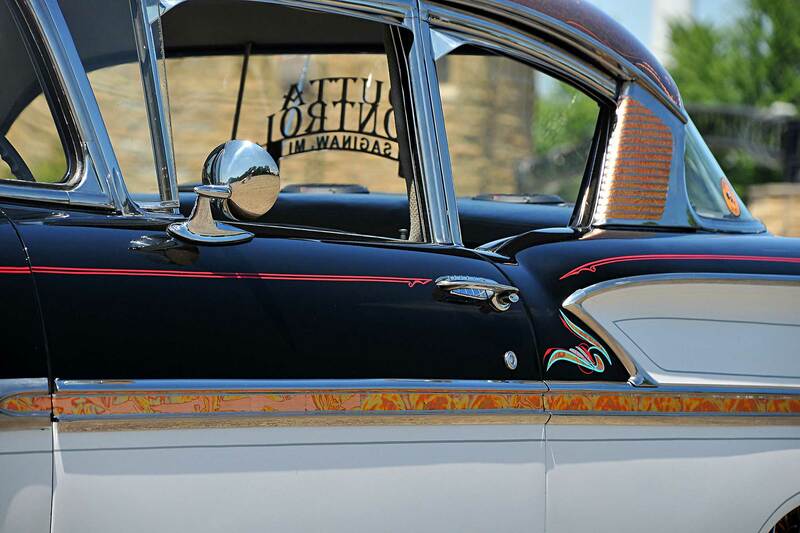 With that said, almost half the 1958 Chevrolets came from the luxury Bel Air line, which accounted for 532,000 sales. 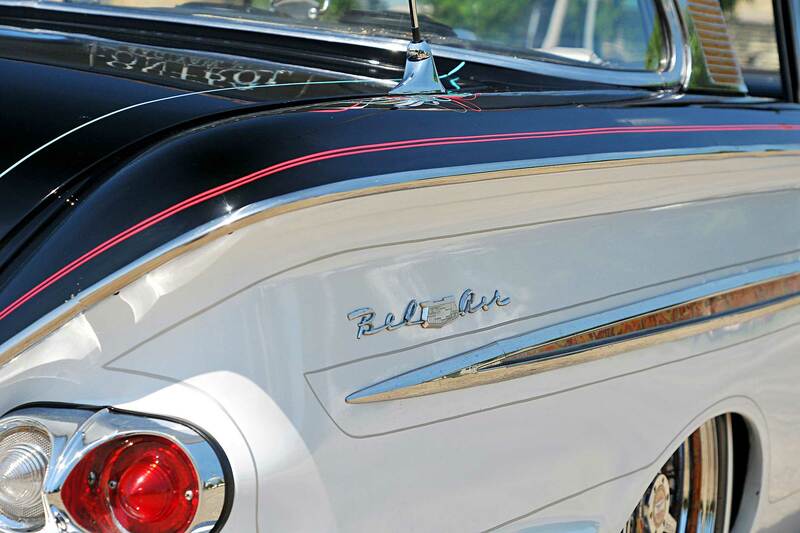 The 1958 Bel Air sported curves before there were lines, and while this third-generation Bel Air lasted only one year, it introduced new styling cues, which included a new dash, broad grille, quad headlights, and a tail sporting a fan-shaped alcove on both side panels. 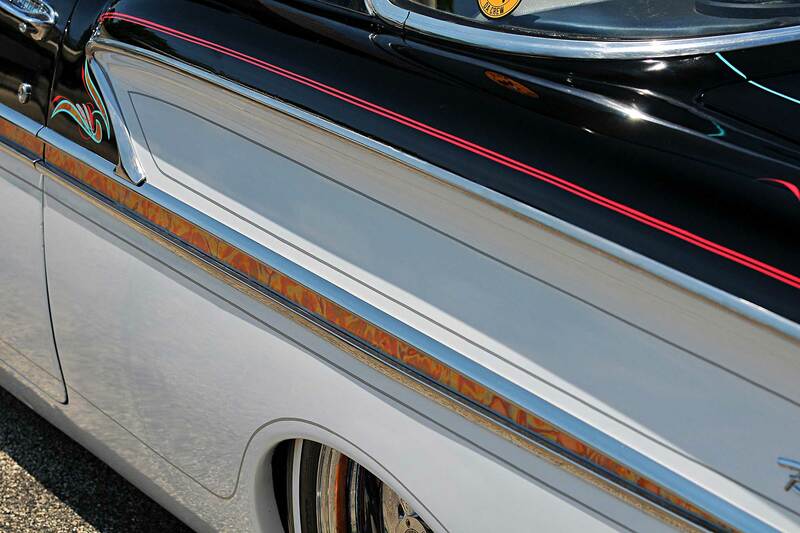 Yet as the owner of a 1964 Impala his heart was always set on the 1958, so when one became available for purchase, Duane knew that it was time to sell his more-common 1964. 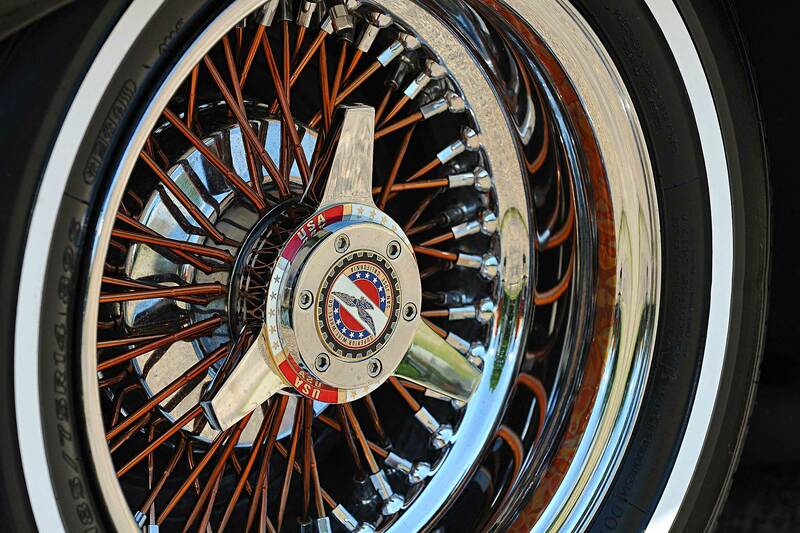 The very first step was adding the wire wheels to complement the Chevy and instantly show the direction in which it would be going. 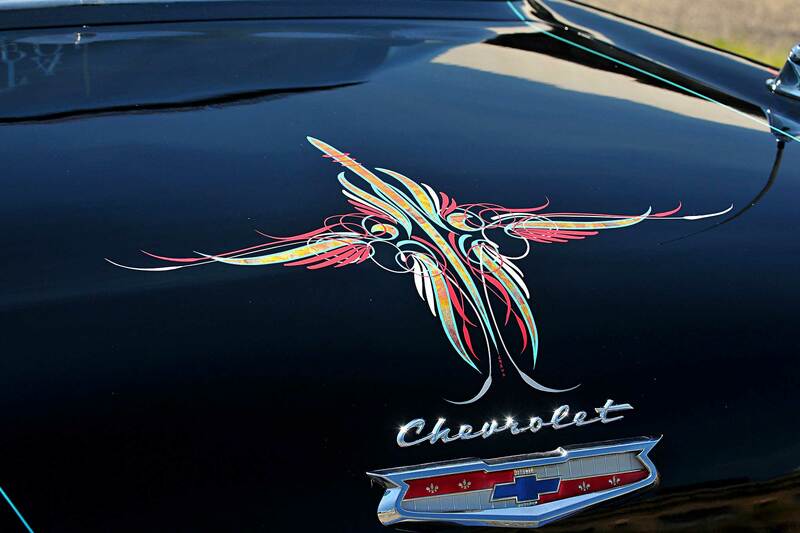 With the lack of good local paint shops in his area, Duane contacted Chavo from Arizona and flew him in for a week to lay down the patterns, graphics, and leafing throughout the Chevy. 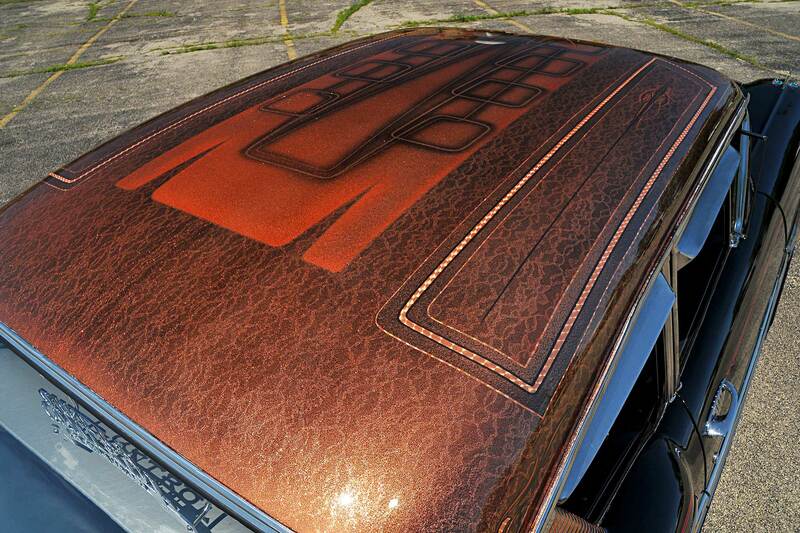 El Joe Kandy Prado added the copper penny roof with lace and watermarks to stand out. 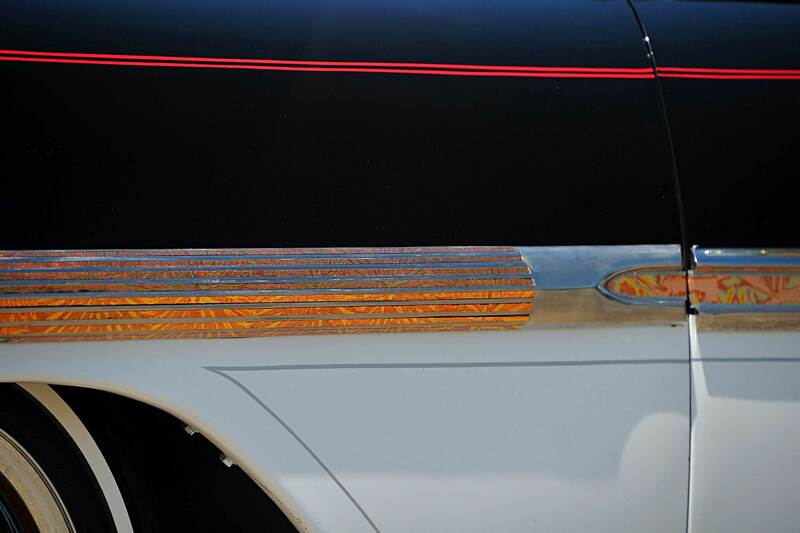 With his “not wanting to cut into a classic” phase now in the past, Duane decided to pop his hydraulic cherry by having good friend Kenny Baker come to Duane’s garage and add a full Pro Hopper whammy setup with Hi Low Zigzag dumps with Italian dumps for show-quality looks and performance. 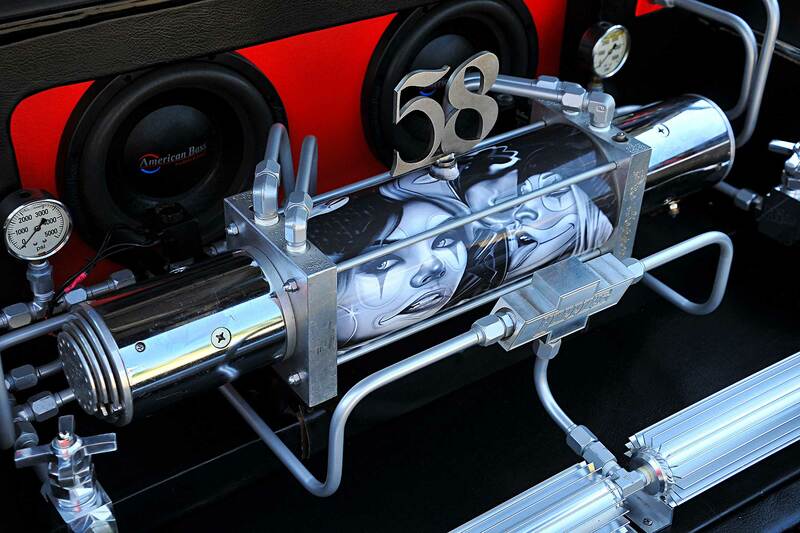 Transmission coolers were added to keep the fluid temperatures in the pumps down for when the vehicle is moving. 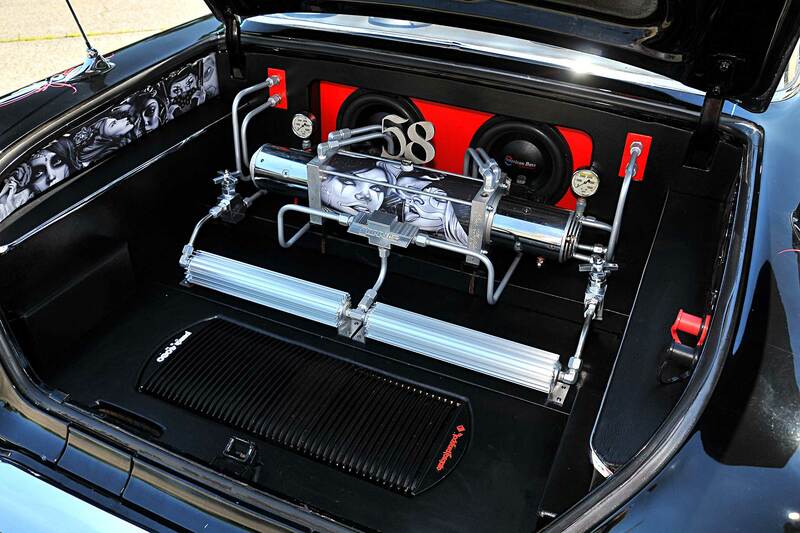 Baker took control over the trunk, adding a sound system strategically placed behind the setup and amplifiers built in front. 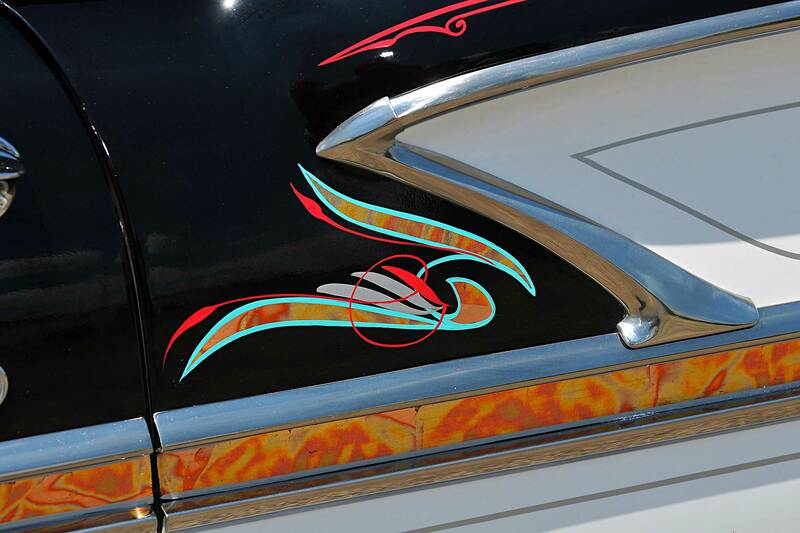 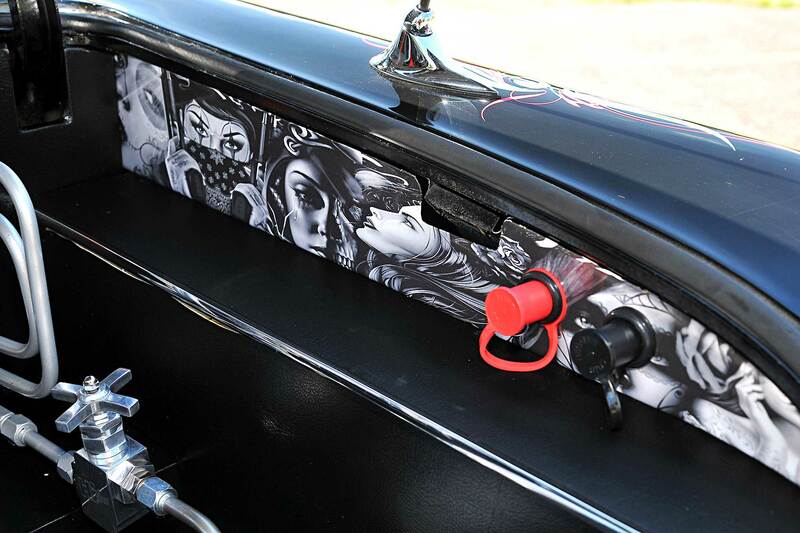 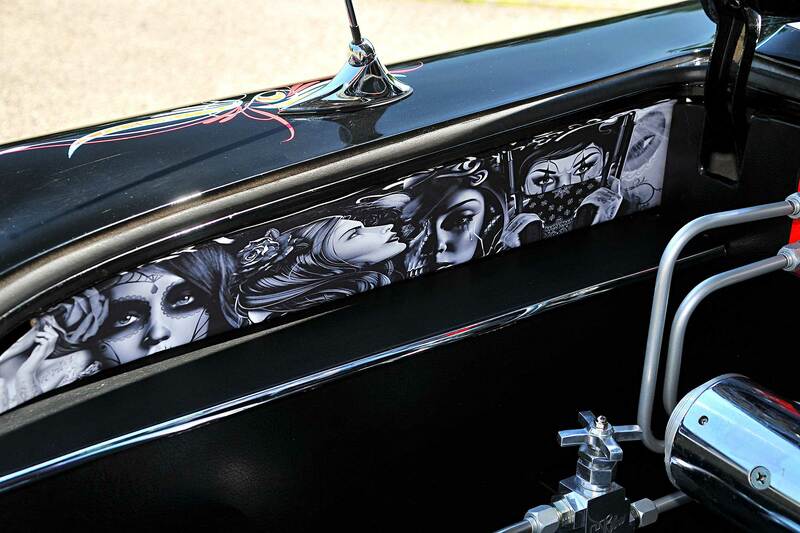 The Bel Air side trunk panels were muraled-out, along with the murals on the whammy pump. 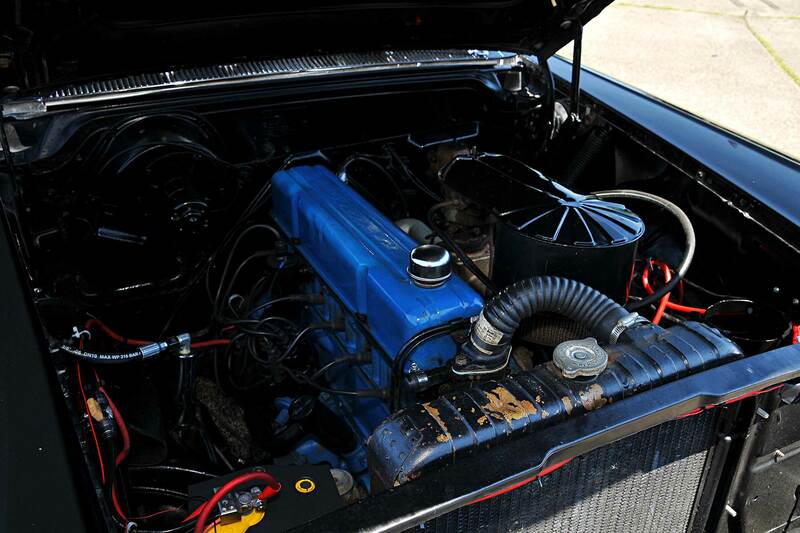 The original motor was working properly, so Duane did minor alterations to keep it efficient and effective on the Michigan roads. 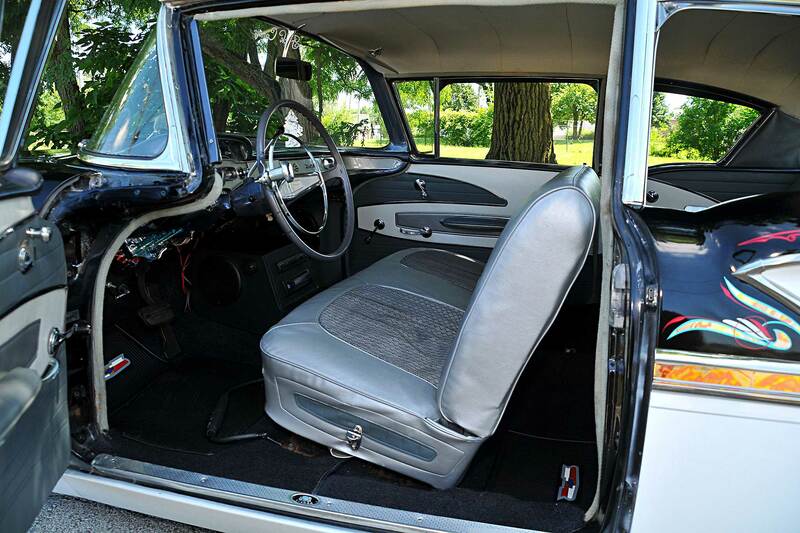 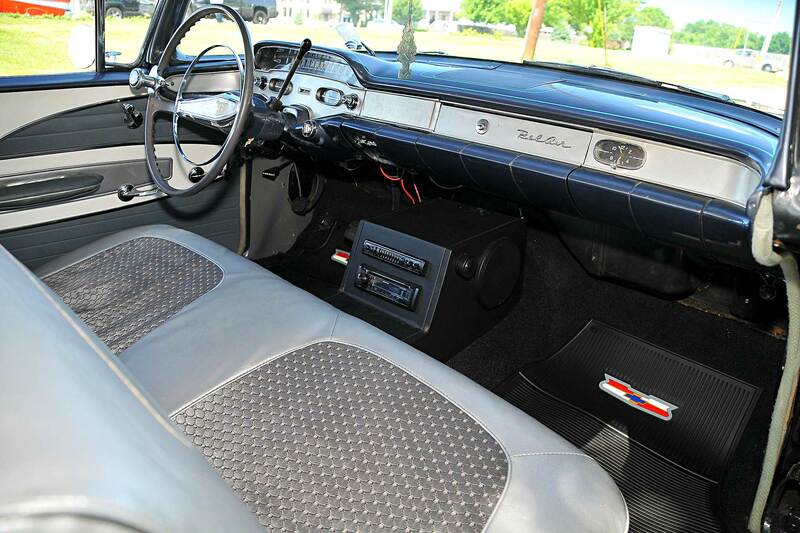 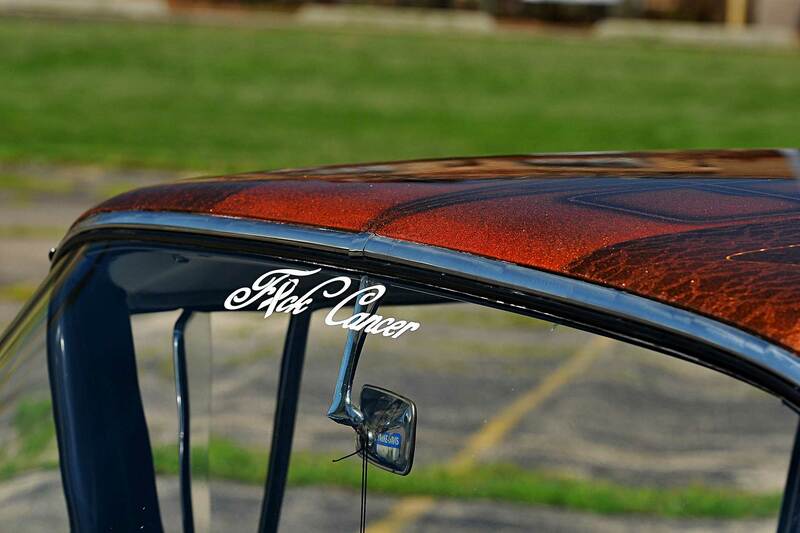 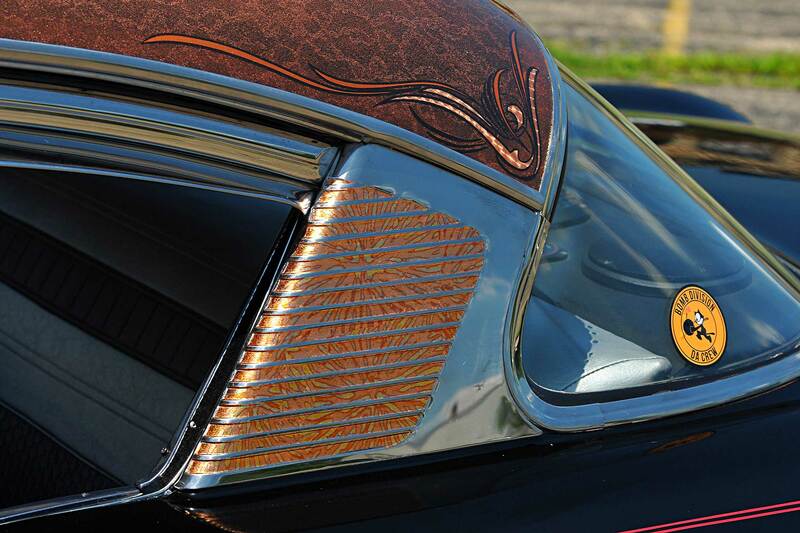 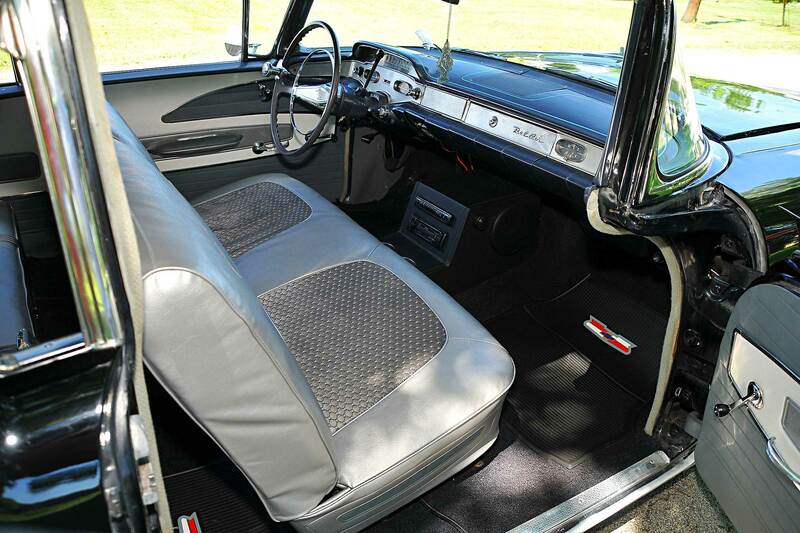 When it came time to touch up the interior, Duane contacted Impala Tone from Majestics at Cars Inc. in Rochester, Michigan, for seat covers and interior panels. 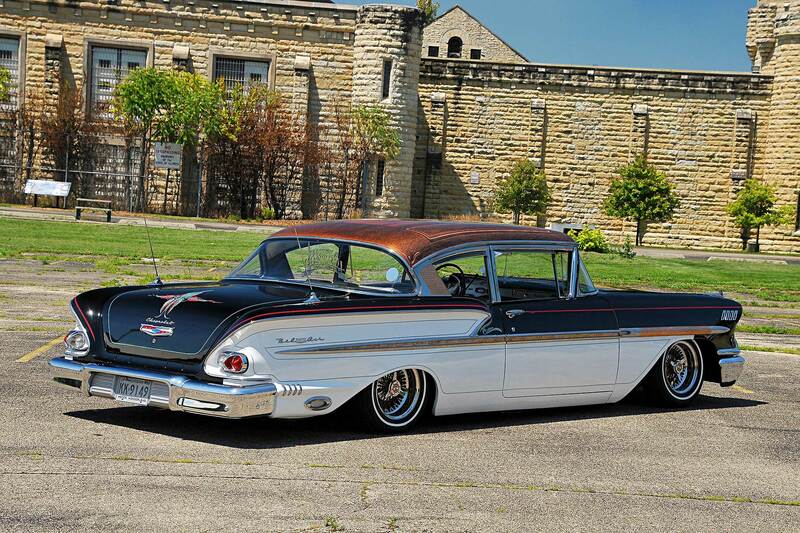 Once they arrived he had Uncle Bob install them inside the Bel Air. 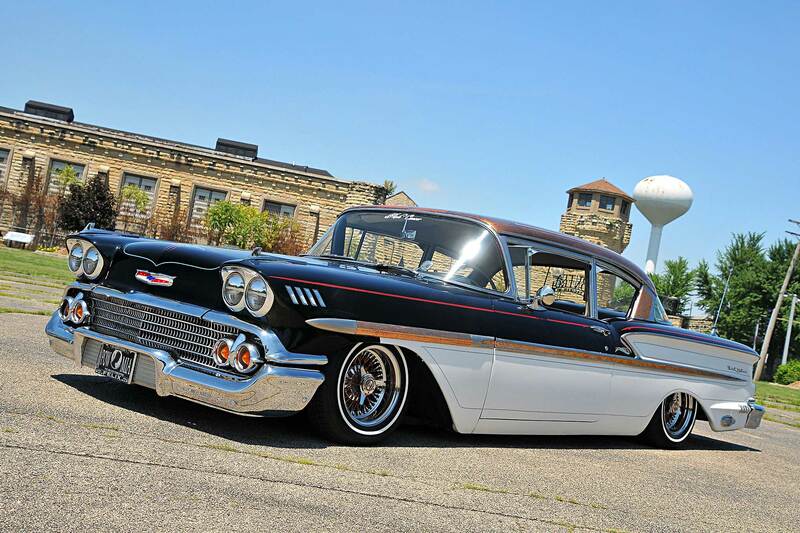 Where most custom lowriders spend the majority of time being built in shops, Duane is quick to point out that “Cloud 8” was built entirely in his garage over weekends. 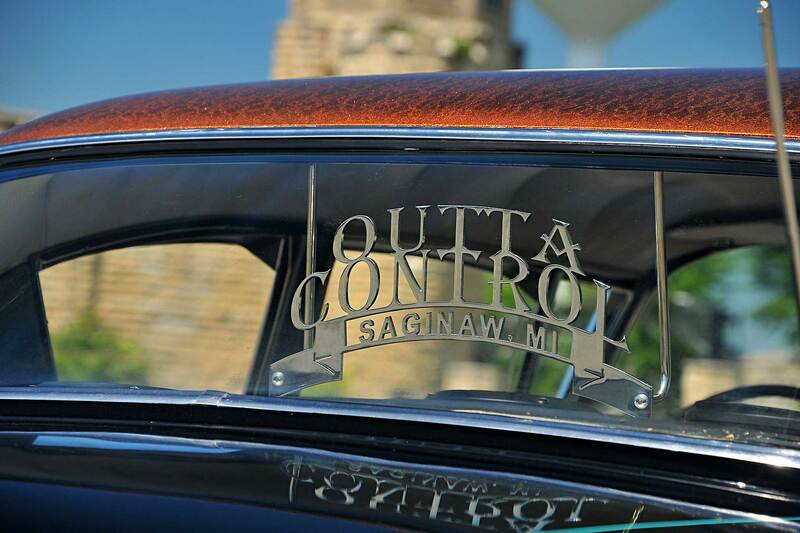 He wishes to thank his Outta Control club brothers who helped him in making his dreams finally come to fruition. 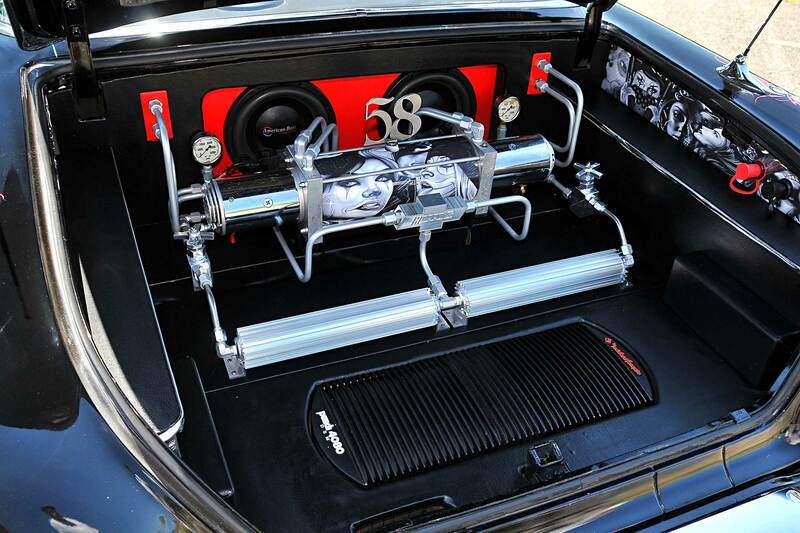 Special thanks go to Kenny Baker and Alex Ornelas for all their help in making his Bel Air “Cloud 8” stand out amongst the sea of Impalas.